Your primary drive, transmission and rear drive sprockets all combine to determine your cruising rpm as well as your final top speed. This calculator will show you your speed in each gear from everything from a stock bike to an all out drag bike with a separate jackshaft as well as the one we love the most, the Bonneville racer. The big end is where it's at! Engine RPM -- You can enter your final redline figure or any other rpm, say the rpm you want to cruise at for a given speed, and the calculator will help you figure out the transmission and sprockets you will need. Primary Drive -- This can be the oem compensator sprocket which is connected by a double row chain to your clutch...or a belt primary which comes in a variety of pitches and widths. In any case, it's a front and rear sprocket of some sort. One end at the crankshaft and the other end going into the clutch/transmission. Transmission -- Four speed early items, five speed later transmissions, aftermarket six speed gear sets, two speed and three speed planetaries, high gear only Pro Dragsters...there are lots of options out there. Enter your given ratios and see what your speeds are. 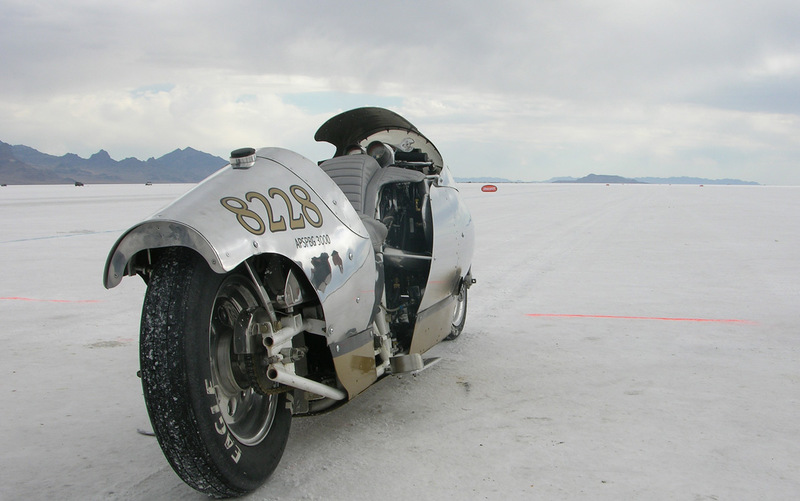 Jackshaft -- Some drag race bikes and some Bonneville designs will use a intermediary jackshaft either to gain an offset to clear a wide tire or to prevent a final drive chain from being "too long". Diameter of the Rear Tire -- You need to know the height (diameter) of your rear tire when properly inflated. Tire Growth -- At speed the tire will grow. For regular road tires the effect is neglible but for the larger drag racing slicks it is considerable. As the tire expands your final drive ratio changes. In effect the tire becomes a variable gear and part of your "transmission". Wheelspin -- In drag racing and at Bonneville you are going to have a percentage of wheelspin you are going to have to plan for. This will depend on a lot of factors which have to be determined, mostly through experience. You will have to gear "taller" to achieve your desired trap speed. For drag racing with ultra high horsepower apps like our 113 ORCA Turbos this should be about 5%. For Bonneville where traction is a variable depending on salt conditions you may have to figure in 10-20%...i.e. rear wheel going 220-240, front wheel going 200. Engine RPM rpm Enter your target RPM. This may be peak rpm at redline or any other rpm. If you plan your bike to cruise at a certain rpm band where your engine is smoothest or where your torque band is at some optimum point choose this to work out your gearing. Note: You can enter a number < your tach speed by a certain % to factor wheelspin. :1 1 for street tires. 1.1, 1.15, 1.2 etc. for drag race slicks that expand with rpm.